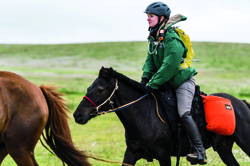 Jess Mencer Peláez ’05 spent months preparing for a grueling ride across Mongolia. Was it worth the risk? Read the first part of Jess Mencer Peláez ’05's story, "Grabbing Life By the Reins." Dusk was descending on day two of a 1,000-kilometer horse race across the isolated steppes and mountains of Mongolia just as Jess Mencer Peláez ’05 and two riders neared the fifth urtuu, one of twenty-five stations strung across the landscape like Genghis Khan’s legendary postal system. The trio was among thirty-four riders competing in the annual Mongol Derby, the world’s longest and most challenging horse race. That day they advanced 120 kilometers (75 miles) despite a host of setbacks. As darkness fell, Peláez rode ahead of her companions to scope out the proximity of the urtuu. She crested a hill and dismounted her feisty black horse, Anthracite. A local man on a motorbike rode up to Peláez in the dark. What she initially thought was a friendly greeting turned into lewd gestures requiring no translation. As she led Anthracite away, the man circled her on his bike, threatening. Her riding companions were nowhere to be seen. She pushed the help button on her GPS, reached for her knife, and moved off-road. She extinguished her headlamp, trying to blend into the amplified darkness. Another bike appeared with two passengers. They turned off their headlight as they approached. That’s when Peláez knew she had to get back on her horse. Peláez arrived at the urtuu physically unharmed and took the next day to recover. On day four she returned to the saddle, but the ride was marred by lightning, thunderstorms, and freezing rain. The challenges had piled up, leaving her numb. “We were riding through a valley bordered on both sides by a low alpine environment. We saw a wild stallion with an incredible flowing mane and tail herding his mares and foals up a mountain slope through a field of wildflowers—it was gorgeous.” Still, Peláez was unmoved. “I realized I wasn’t appreciating this . . . and it wasn’t worth it to be doing something so, so risky without getting anything out of it.” Only eighteen riders completed the ten-day race, and Peláez wasn’t among them. After forty-eight hours of soul-searching, she decided to drop out. Despite the months of training, the $10,000 to participate, and her teammates’ efforts to convince her to stay, she wanted nothing more than to go home to Australia to be with her husband, Carlos, and her pets. Peláez knows to trust her instincts. She has scaled mountains, stood atop volcanoes, and travels extensively. She expects more opportunities ahead, and she’ll retain the practice that she encourages others to follow.